As mentioned last month, the them for the first Nerd Block Classic for 2017 is “Stark Industries”, with items based on Tony Stark/Iron Man. Should hopefully be a good box with that kind of theme, so let’s take a look. Item number one: a lapel pin. 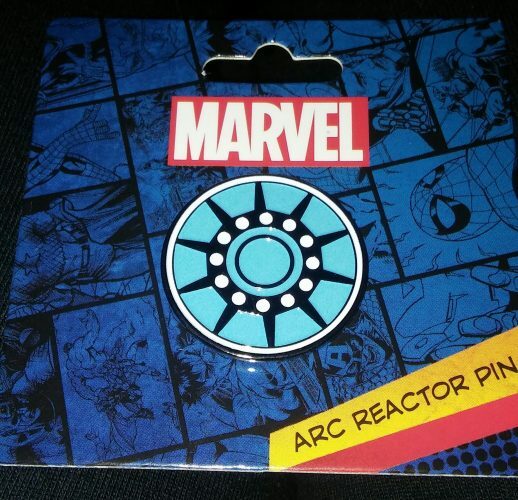 Designed to (obviously) look like the Arc Reactor, this is one of the nicer pins/buttons I’ve gotten in all of these crates over the years. Plus, it’s metal instead of vinyl, which is always a bonus. Up next is an interesting item, and one I’ve never owned before. 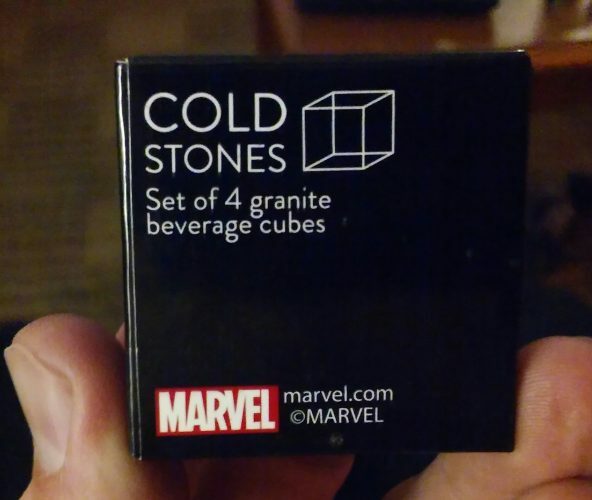 Apparently, these are just cubes of granite that keep your drinks cold, as an alternative to ice. 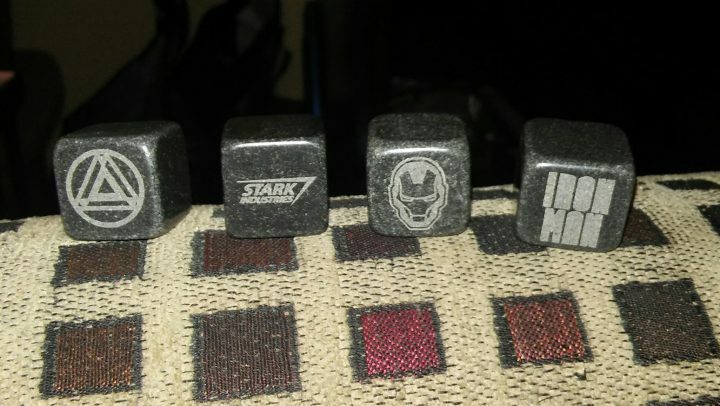 I haven’t had a chance to try them, as you have to freeze them for four hours before use, but they look really cool with the engravings. And, if they work, they’ve got a practical use, especially in my household (my wife and daughter are obsessed with using ice in their drinks). Shirt time! And my very first Iron Man shirt, to boot. 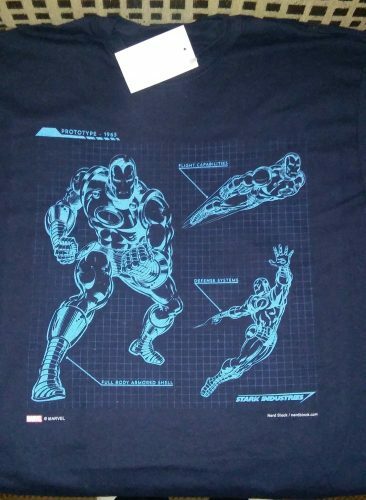 Designed to look like a blueprint of the Iron Man prototype suit, and on blue instead of the usual black. It’s not the flashiest of shirts, but I like the design and it also fits well. And any colour other than black for these shirts is welcome. 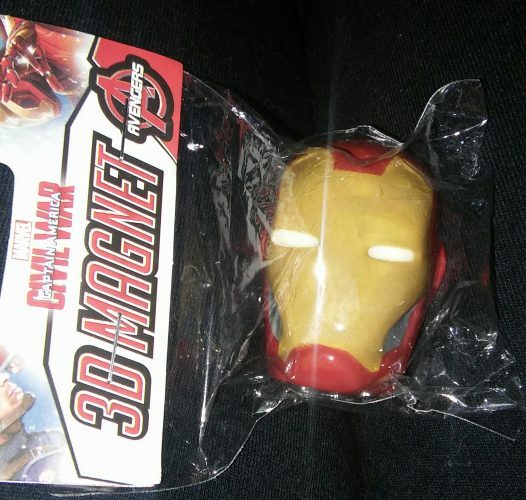 A 3-D magnet is the next item in the box. Nothing special, but we actually use refrigerator magnets pretty regularly in my household, and this one looks better than some of the others we have, so that’s good. Plus, practical items that I actually can (and will) use are never a bad thing. And finally…hmm. What do we have here? Normally, when there’s boxes within the box, there’s some kind of picture showing what’s inside. 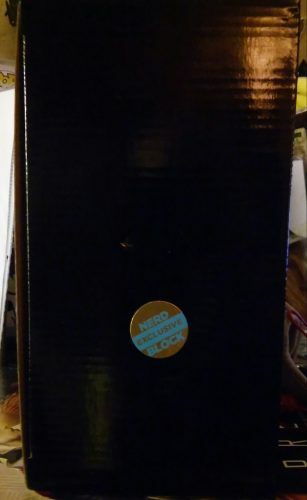 Instead, we have just a solid black box with a “Nerd Block Exclusive” sticker on it, nothing more. Interesting. Well, no time like the present, right? Let’s take a look at what’s inside. Wow. These are actually really beautiful. 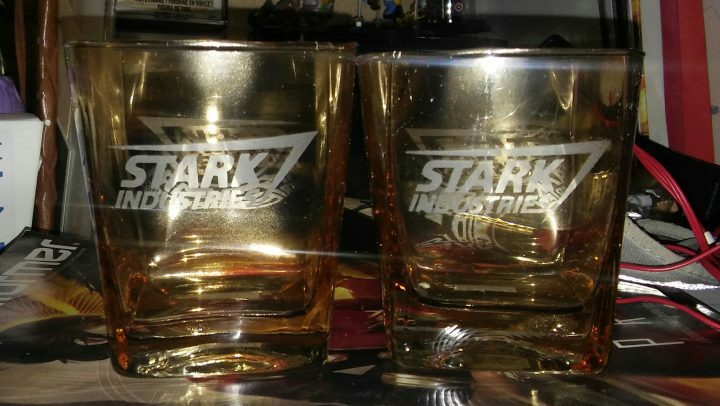 If you can’t tell, it’s a pair of whiskey tumblers with the Stark Industries logo etched onto two sides. I’m not a consumer of alcoholic beverages, but whose to say I can’t drink juice or water from these beauties? These are definitely a nice addition to our ever-increasing collection of geeky/nerdy dishware and cutlery. Overall, a pretty good box this month, and every single item fit into the theme, which doesn’t always happen. And every single item can/will get used by myself and my family, which automatically gets a thumb’s up. The tumblers and the shirt would have gotten my seal of approval alone, but the other items are pretty cool, too. Next month, the theme will be “Time Travel”, so here’s hoping for some Doctor Who collectibles at the very least. I have yet to get any since I started subscribing to Nerd Block. I’m expecting Back to the Future as well. See you then!